Some songs are made to send a message to people, I am not entirely sure here if this is the case for Devastatin’ Dave (a.k.a. 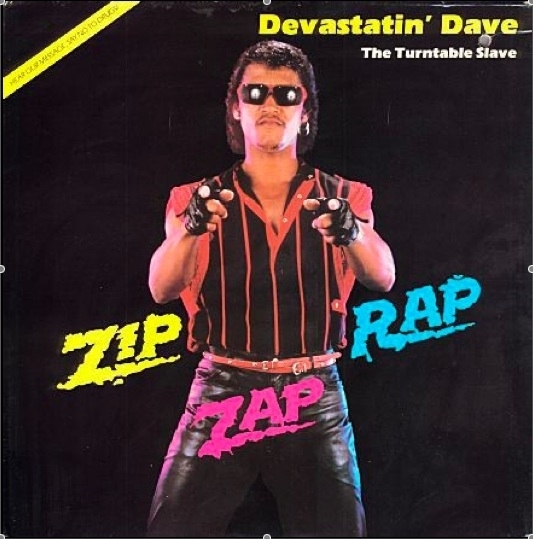 The Turntable Slave) and his single “Zip Zap Rap” published in the 80s by God knows who and why. The fact is that behind this leathered dark-glassed fella there is a clear message against evil. The evil in this case is drugs. Then he goes forever, lots of words which I may feel not to post down here but embrace yourself to the video down below if you dig them. Devastatin’ Dave’s musical career starts and ends pretty much here. Scoffed, taunted and ignored in the 80’s the singer rediscover a second youth and maybe an unexpected and final consecration during these modern times. As a matter of facts, “Zip Zap Rap” which probably sold no copies at all during his release, is very popular nowadays between the internet users. Tons of references, youtube videos and absurdly amounts of streaming which is probably giving him tons of royalties to spend in anything he likes, but if I could give a friendly advice here and be the devil’s voice again, I would say that maybe won’t be wise to invest them in making new music. I think we are fine with this one.